craft, barges & ferries to superyachts, fishing & sailing boats with significant beams, weight and appendages will benefit from reduced downtime by not having to travel extensively for service. Additionally, this new Marine Travelift will give rise to significant employment opportunities and business growth for the many nearby ancillary businesses in Carteret & nearby counties. Prior to the 300-ton lift’s installation at Jarrett Bay, heavy vessels in this region had to take their refit & repair business to Virginia or Florida. Now, everything from military craft, barges & ferries to megayachts, fishing & sailing boats with significant beams, weight and appendages will benefit from reduced downtime by not having to travel extensively for service. 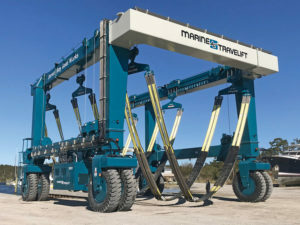 Additionally, this new Marine Travelift will give rise to significant employment opportunities and business growth for the many nearby ancillary businesses such as engine and component operations, as well as the surrounding non-endemics, such as hotels, restaurants and shops in the communities adjacent to Jarrett Bay’s Beaufort facility. Moreover, vessels that frequently transit past the Jarrett Bay facility now have the option of having work done in Beaufort on their annual migrations north and south as their business follows the seasons, further enhancing the economic boost to the region from this combined Small Shipyard Grant & Jarrett Bay investment. The 175-acre Jarrett Bay Marine Industrial Park is located on the Intracoastal Waterway at MM198, adjacent to the Beaufort inlet for convenient access to vessels transiting inshore or offshore. In addition to the nearly two-dozen boating-related occupants within the Marine Park, Jarrett Bay Boatworks’ footprint within the Park comprises 137,000 sq. ft, of service and repair facilities, including a climate-controlled paint building – providing every type of marine service and product available from one location. 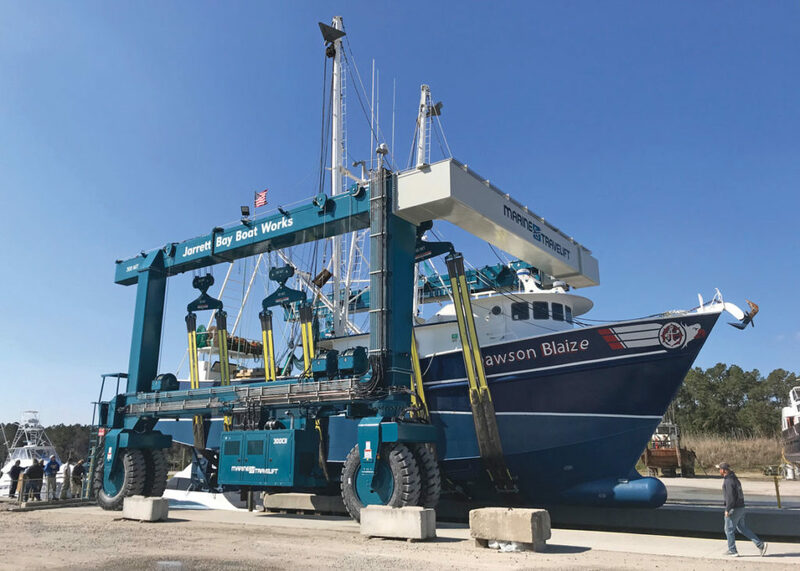 Jarrett Bay Boatworks management is still looking to fill approximately 25 new positions to serve in all capacities thanks to the added haulout capacity of the new 300-ton lift. With a global shortage of boatyard labor, Jarrett Bay also worked with MARAD to train an existing and new workforce to receive industry-specific training and certification through the region’s Carteret Community College – identified as a future Domestic Maritime Center of Excellence.